What are the Best Herbs for Pregnancy and Which Ones are Bad? Are Herbs And Pregnancy A Good Combination? How can herbs benefit you during your pregnancy? Is it safe to use herbs while you are pregnant? How can you determine if an herb is safe? It’s difficult to treat pregnancy ailments because so many medications are off limits. Many pregnant women seek natural alternatives, and end up turning to herbs for support during the duration of their pregnancy. Herbs can be used to treat common pregnancy symptoms, but certain herbs are restricted for expecting mothers. Most herbs are safe if they are not considered stimulants and you don’t use them in high doses. It’s important you educate yourself on the correct uses of herbs during pregnancy and understand why certain ones should be avoided. Why Should You Use Herbs? How Do You Know Which Herbs To Use? Why Are Herbs Not Commonly Recommended During Pregnancy? Many expectant mothers are seeking ways to help relieve their symptoms, but usually come up short because many remedies are dangerous to their unborn baby. Herbal remedies have been observed to be gentler and safer compared to their over-the-counter counterparts (source). In fact, many herbs have a high safety profile and little evidence of harm. Herbs are natural, and natural remedies are not as foreign in your body as pharmaceuticals. This is why herbs have been the main source of pain relief for thousands of years. Pregnancy is very demanding on your body, and it’s not uncommon to seek relief for your symptoms. You have a long journey ahead of you, and you want to be able to make the most of your time before that little bundle of joy becomes the center of your universe. Many expectant mothers don’t realize the power of herbs and what discomforts they can help relieve. As long as you discuss your options with your doctor and thoroughly research the herbs you wish to use, you and your baby should be just fine. Herbs can treat many different problems you might experience during pregnancy. Some of these problems include, but are not limited to, the ailments below. One of the benefits of using herbs is that they are packed full of vitamins, nutrients, and minerals which are beneficial to you and your pregnancy. If you are experiencing any of the above, it is best you consult your doctor before beginning use of any herbal remedies. You do not have to avoid herbs during pregnancy. They have been beneficial for many expectant mothers, and they can benefit you. About 10 percent of women use herbs before becoming pregnant and during the pregnancy. It’s essential you thoroughly research the herbs you want to use before you begin doing so. This is because herbs are not regulated by the FDA (Food and Drug Administration) like other prescription drugs (source). This means there can be varying results with herbal products. They are not routinely evaluated, and it is possible they would have misleading labels. Just because something is natural does not mean it is safe. Sometimes those FDA-regulated drugs are much more reliable than their herbal counterparts. As long as you stick to only using herbs with a positive track record, you and your baby should be just fine. It’s difficult to find reliable information regarding the safety and effectiveness of some herbs during pregnancy. The best thing you can do is research to the best of your abilities and always seek the permission of your doctor or midwife. Even if the internet says a certain herb is safe, it might not be safe for you. Each pregnancy is different, and each woman can respond differently to particular herbs. There are herbs many doctors support and recommend. There is not clinical evidence to completely declare an herb “safe,” but there are observational studies that have confirmed no complications between mothers who used the herbs and their babies. It is crucial you avoid herbs altogether during the first trimester, except the occasional usage of ginger root for nausea. Herbs that you would use in regular amounts during cooking are fine to use during pregnancy. The first trimester can be detrimental to the development of your baby if outside medications or herbs cause developmental abnormalities. Other than in the first trimester, the following herbs are believed to be the most useful and safe when pregnant. There are numerous others not listed that are still considered safe. The most common method of consuming these herbs is through tea. There are a number of pregnancy teas that include these herbs as ingredients. Many expectant mothers love using Pink Stork tea. This is a great option to help relieve morning sickness. Although there is not thorough research conducted to regulate herbs, there are some that are commonly known as being unsafe. It is important to avoid the herbs in this category because they can be toxic and even cause premature labor. Internal use should be avoided. External use may be acceptable under the guidance of an experienced practitioner. The following teratogens should be avoided as they have been known to cause developmental malformations. This list of herbs probably seems rather extensive, but you are better to be safe than sorry. Pregnancy is no time for you to become experimental with your use of herbs. Even if you believe one of the herbs listed on this chart could be beneficial to your pregnancy, it is important you avoid it and find a safe alternative. There are very extreme side effects that can occur from using some of the herbs on this list. Pennyroyal: This herb has been known to induce the onset of a miscarriage. It has been used in the past as a natural way to try to induce abortion. Red clover: This herb can affect estrogen levels which can provoke unwanted changes in your body that are vital to sustaining a pregnancy. Wormwood: A number of problems can occur if you consume wormwood because it attacks the home of your unborn baby, the uterus. Some of the herbs listed above are safe for consumption in food, but extremely unsafe when taken in medicinal amounts. Many pregnant mothers immediately associate using herbs with herbal tea. There is an entire market of herbal teas designed specifically for pregnant women. Many of the companies that make the herbal teas will include labels claiming they are safe and healthy, but there are no clinical studies to support this. There are numerous herbal teas on the market that are safe, but there are several that aren’t. You should always look at the ingredients list, and if you see something you don’t recognize or know is not safe, you should choose an alternative. There are some herbs that are not safe to consume in tea, but are safe to consume in food when pregnant. This is because the herbs found in teas are much more concentrated and potent than the amounts found in food. If you choose to drink herbal teas during pregnancy it’s important you don’t drink too much. If you consume excessive amounts, this can cause harm to your developing baby. Small amounts of presumed safe herbal teas, as well as receiving the permission of your doctor, gives you the green light for safe consumption (source). If you are skeptical about purchasing an herbal tea, you can always choose to make your own. This ensures you are in control of each ingredient you use and their amounts. Just because you are making your own herbal tea, does not mean that you can drink excessive amounts. It is still important you consume your homemade tea in moderation. Many doctors will approve and allow you to use herbs if you ask, but they will not be the ones to initiate or recommend them. This is once again because of FDA regulations. Midwives fully support the use of herbs and will urge you to use them. If for some reason your doctor advises against herb usage, you could consult with a midwife. The doctor’s decision could be in your best interest or it could come down to medical preference. No matter the reason, a second opinion never hurts. Although many herbs are safe to use and have been safely used, they have not been proven to be safe. That is the distinction your doctor will be concerned with. The consistent theme with herbs and usage while pregnant comes down to the lack of regulations. There is thorough proof of the safety and effectiveness of herbs, but there is not thorough scientific evidence. The decision should ultimately come down to you weighing the risks and benefits associated with the herb you want to use. The problem with herbs and with medications during pregnancy is that no one will knowingly subject pregnant women to substances in a research setting that might not be safe. No research translates to no recommendations. Look at the history of use of an herb and see an herbalist if you need expert advice. If your symptoms are so severe you know you need relief and you are going to seek medicinal relief, you may want to use an herb. Many herbs can be much easier on your body than over-the-counter medication, and they sometimes have fewer side effects. If your symptoms are rather bad, but manageable, you need to weigh the risks and benefits. To do this, you will consider whether or not relieving your current symptoms is worth the potential risks associated with the herb or medicine you want to use. While herbs and over-the-counter medications can help you, the best option for you and your baby might be to avoid both. Sometimes you need relief, and that is okay. Make sure the problems you are having are not a cause of something else first. Many mothers will have symptoms that are caused by other underlying issues. You may have a severe headache because you haven’t drank enough water or had enough sleep. Always try to pinpoint what caused your problem to see if something simple like water or rest can help make it go away. Unless directed not to by a doctor, make sure you are taking prenatal vitamins and folic acid supplements. Your body demands high levels of the nutrients that these provide, and without them you could experience severe symptoms. You would much rather cover all of your bases and make sure you are doing all that is in your power to relieve your symptoms, without seeking outside medications or herbs. Most of the minor symptoms you experience during pregnancy can be relieved and soothed with herbs. Although herbs can help many issues, numerous ones require immediate medical attention and no time spent on herbs. If you experience any of the following, seek medical attention. Severe headaches and blurry vision. Ruptured membranes before 37 weeks. These are all issues that should prompt you to seek help immediately. If you ignore these problems, you could put you and your baby in serious risk. No fetal movement is only relevant if you are far enough in your pregnancy that you have already felt your baby move. If you have not felt your baby move yet, this does not pertain to you — that special day will come very soon! 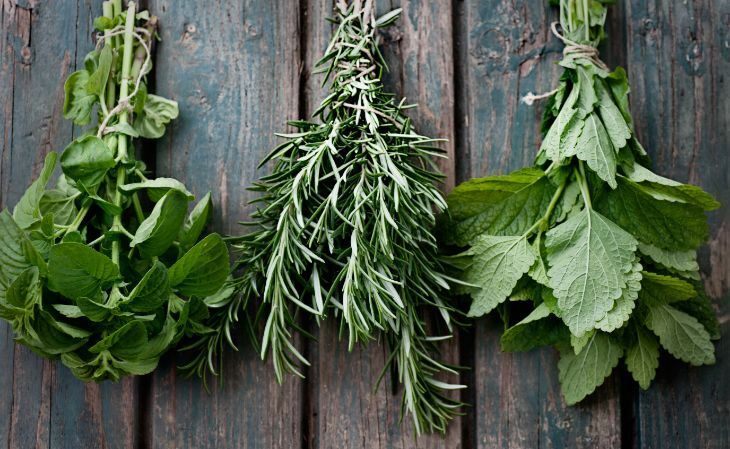 Following these simple steps may help you incorporate herbs safely into your pregnancy. The same herb can have varying strengths. Because herbs are natural and not synthetically produced, their capabilities are not consistent. Herbs can have a different impact on each individual, so you need to learn your body’s limits and tolerance levels before you dive right in. Many different herbs can be used for different reasons. Make sure you find one that matches up with your symptoms. You don’t want to risk using one that might not help, and then find out another is much more effective. You need to start with a small quantity and then gradually increase your dosage. If your body responds positively, you can continue use. It may be suggested you use larger quantities of an herb, but your body might respond to small quantities — use the smallest amount possible to get the benefit. You should never use more of an herb than the guidelines suggest. As mentioned, it is recommended you try to use less of the recommended dose if possible. Before beginning the use of any herb, it is important you confirm its use with your doctor. You should not introduce any questionable substances into your body without a doctor’s confirmation. This is in the best interest of both you and your baby. Like most medications or remedies during pregnancy, anything you ingest has the capabilities of harming you and your unborn baby. If you choose to use herbs that are not considered safe during pregnancy, you are putting yourself and your baby at risk. It is important you pay special attention to the way in which you are supposed to use an herb. Some herbs are safe to consume with food, but become unsafe when you use them in medical-related doses. It is not worth it to use unsafe herbs that temporarily relieve pain, if it can cause life-threatening or permanent damage to your baby. A temporary solution is not worth a permanent outcome. Some herbs are safe for you to use during your pregnancy, and they can help you relieve many of your symptoms. Although they have been safe for others, that does not mean they will be safe for you. Like most medications, herbs also have side effects. You may respond differently than someone else who has safely used an herb for a reason similar to yours. Remember it is always best to try to avoid using any herbs or over-the-counter medications if the benefits you will receive do not outweigh the risks. The only way to keep you both 100 percent safe from those side effects is to avoid a product altogether. It is in your best interest to always consult a doctor before beginning to use herbs. You are responsible for two lives right now, so take the extra precautions to keep you both safe and healthy. Will Pineapple Bring on Labor During Pregnancy?